After the First World War, the army needed to renew its vehicles. 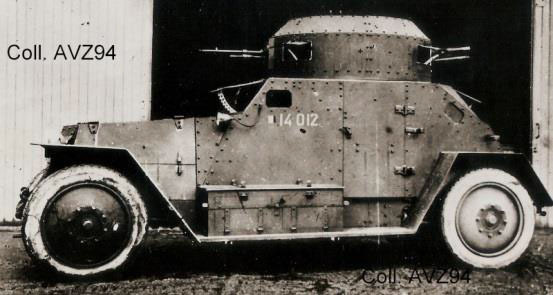 In 1922, the Cavalry Command launched a competition for a wheeled armored car (AMC n°1) for the cavalry and a tracked armored car (AMC n°2). The AMC N°1 had to have a speed of 55 kph and a 12 mm armor protection, and weigh less than 4 tonnes. It had to carry 4 men including a second driver for reverse operations. Renault, Berliet and Panhard & Levassor each proposed a vehicle. It was the last manufacturer that won the day. Panhard & Levassor supplied the Army with a 20 HP utility vehicle chassis whose basic mechanic components had been modified: improved suspension, more appropriate gear ratios and a locking differential. The Vincennes workshop designed the armor protection and weaponry (a 37 mm cannon and a machine gun mounted opposite each other on the turret). The vehicle was called the AMC N°1 type 138 and was tested for a year. It underwent many changes, including its silhouette which resulted in the AMC 165 then the AMC 175 which had improved suspension. The AMC 175 was used up until 1945 mainly on foreign theatres of operations (TOE in French) and the last model was called the AMC 175 TOE as a result.